Game Changers: The LumoPro lp160 and the Paul C. Buff Einstein 640 - Commentary by photographer Craig Wassel, Batavia, Geneva, St. Charles, Illinois (IL), professional portrait, event, and artistic photography. Back in April 2011 when I wrote "Photography Advice: Be Careful Who You Listen To", I wanted to show that quality light from small flashes is not only possible, but also extremely effective and versatile in many situations. I’m not a world renowned photographer, so I also pointed to David Hobby at the "Strobist" website and Joe McNally as masters of light who demonstrate on a regular basis the usefulness and creative possibilities of speedlights. In that commentary I was strongly but constructively critical of Ken Rockwell’s dismissal of high end speedlights as a waste of money. I still stand by what I wrote, but it is also still important to be continually learning new and/or better ways to approach lighting (or anything in photography or life for that matter). With that continued learning, my own thoughts on building a versatile, transportable, and powerful lighting kit are changing and evolving. Two pieces of equipment are changing the game for me. The most portable way to enter the world of off-camera lighting is to use speedlights. When we hear “speedlight”, most of us immediately think of Canon and/or Nikon. We have reached a point, though, where their more powerful speedlights are nearing or exceeding the cost of some very respectable monolights. With that, it is only fair to Ken Rockwell to say he is fair to point out their relative expense. That expense makes it difficult for the upstart photographer entering the world of off-camera lighting to decide how to start and what to buy first; it makes it difficult for the established photographer to accept spending "studio light" prices but only get speedlight power. There is an excellent alternative, though, and it is the LumoPro lp160. 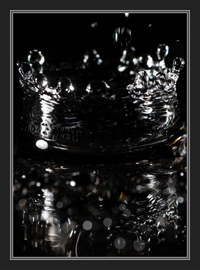 It is a high quality, third party speedlight that is gaining popularity and trust among “strobists”. At $160.00 they are at most half the price of the name brand models, but deliver same the power. The only things they don’t provide are TTL metering, and built-in infrared triggering like the Nikon CLS system offers. I don’t see either as a significant drawback, though. As I noted about back in April 2011, infrared triggering’s weakness is line of sight issues, and that is why most photographers quickly move to relying on radio triggers like Pocket Wizards. As far as the LumoPros lacking TTL: one of the great things about becoming a strobist is you quickly get comfortable setting your off-camera flash levels manually – as well as your camera’s shutter speed and aperture. When you set your exposure and lights this way, you are no longer married to any type or brand of flash. 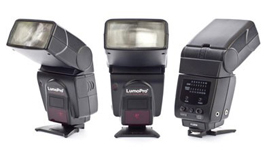 Obviously the LumoPros are very affordable, portable, and light-weight, making them very easy to take on-location. Are there any disadvantages? No, just limitations when compared to monolights. As with any speedlight, the limitations are power and cycle time. You can definitely use them in umbrellas and softboxes if your subject or group is within 15 feet or so, but you won’t be able to light up a larger venue or anything that is a fair distance away. As with any speedlight and depending on your power setting, you may also find yourself waiting for their charge cycle so that you can take your next shot. The light weight and portability of speedlights is unbeatable. The longer you are a photographer, though, the more you long for faster cycle times and more flash power in certain situations. 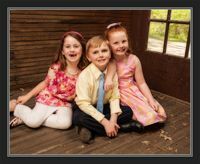 As a portrait photographer, faster cycle times for me means not missing kids' best moments and expressions. More power means being able to easily match or overpower ambient light when outside on bright days. 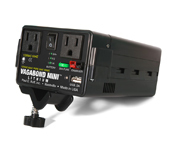 Getting that power requires taking studio monolights or heads outside, along with very heavy and expensive power packs. Without assistants and a high budget, this was not always practical or manageable. Technology is now making it possible, and one of the best monolight / battery combinations is the Paul C. Buff "Einstein” e640 and its optional Vagabond lithium power pack. You don’t have to take just my word for it, though. Do some Google searches for reviews of the Einstein e640. As with anything, you will find some harsh critics and some photographers who have not had good luck with them. However, I think you will see many more reviewers that conclude they are outstanding, and even some who say they are the best monolights at any price. What is more incredible about the Einstein e640 is its size. 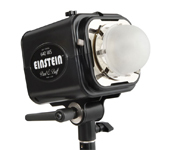 Even though it is capable of 640 watts/per second, the unit is 45% smaller than most monolights. Even the combined weight and size of one Einstein e640 and a Vagabond lithium battery is about equal to most other monolights alone. This power/cycle time/weight/size combination is a game changer. Although heavier than speedlights and not necessarily "light", they are still small and light enough for a photographer to take them on location without hiring assistants to haul gear. 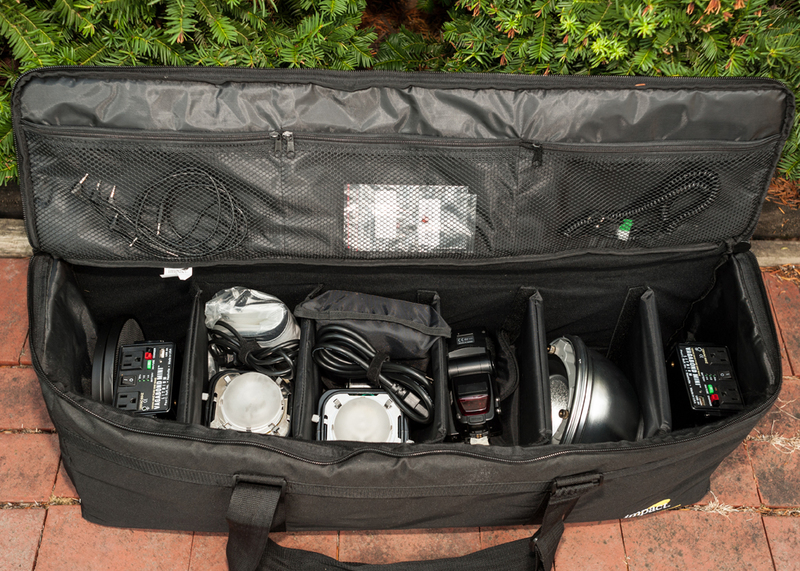 The image below is a 34" x 14" x 8" light kit bag holding two Einstein e640's, two Vagabond lithium batteries, two 8.5" reflectors, two grids, two speedlights, and a few other essential grip kit items. It could actually hold a bit more, but I spread my light stands and modifiers out into another bag. To Recap: these two lights are game changers for me. The LumoPro lp160 is a game changer for giving me speedlight portability at half the cost of the name brands. The Einstein e640 / Vagabond lithuim combo is a game changer for being an extremely powerful and capable monolight that is still portable enough to take and manage on location by myself without dread or back breaking. They have changed everything for the better: how I plan a shoot, how I can pack, and how and where I can shoot. Although I am making enthusiastic recommendations here based on use, I'm not set up to perform technical tests or experienced in writing formal reviews. There are plenty of great ones online, though, and I encourage you to read as many as possible. After you have done that follow-up research, I think you will find the LumoPro lp160 and the Einstein e640 are some of the best, most versatile choices available. Building an off-camera lighting kit means making difficult choices between seemlingly endless options, and making a significant investment. You want to get it right the first time. It only gets more expensive if you find later that what you chose doesn’t get the job done and you want to change your game. Been there, done that. I don't think you can go wrong starting a kit with either one of these. Combining both in one light kit – short of spending tens of thousands of dollars instead of a few thousand dollars – will give you the ability to do almost anything you can imagine and shoot anywhere you want. ". . . Advances in equipment and in technology have always made the impossible merely difficult and the difficult little more than routine. The area that we can all concentrate on now is being creative. I for one welcome everything that helps me to make my work better, and technical gizmos that free my thoughts from the boring mechanics of photography allowing me to be more of an image creator than a picture taker are welcome additions to my kit . . ."
" . . . these two lights are game changers for me. The LumoPro lp160 is a game changer for giving me speedlight portability at half the cost of the name brands. The Einstein e640/Vagabond lithuim combo is a game changer for being an extremely powerful and capable monolight that is still portable enough to take and manage on location by myself without dread . . . "